A high-level soccer player who I recently started working with said that she decides during her warm up whether she is going to have a good game or not. She makes this decision based on how well she performs in warm up and if her body feels “ready” to go. 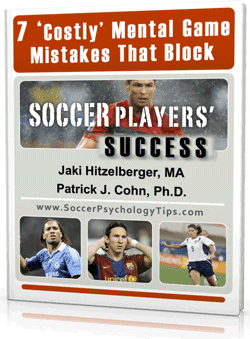 Leaving your confidence to chance in soccer is a huge mental barrier to peak performance. Too many soccer players have this mindset before games. Soccer players’ confidence changes for each game based on the quality of their warm up. These players forget that it’s just that… a warm up. Essentially, when soccer players start to believe they will have a bad game, chances are, they will because their confidence is low. At Peak Performance Sports, we teach athletes that they don’t have to “win warm ups” or perform perfectly in warm ups to feel confident at game time. The goal is to use the time during warm up to get mentally and physically prepared for the game. Most athletes have a physical routine, but very few know how to prepare mentally. Self-doubt during the warm up routine is the number one reason soccer players lose confidence. Instead of feeling confident before warm ups begin, their confidence fluctuates depending on if their shots go in or if their touch is just right. 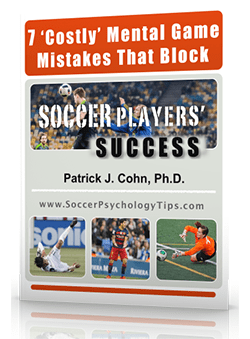 Your soccer confidence tip is to stop making judgments about your performance in the pregame warm-up. Decide even before the game starts that it’s going to be a good day. Even if you feel heavy or miss a few shots on goal during warm up, know that once the game starts and adrenaline kicks in, you will be ready to execute. 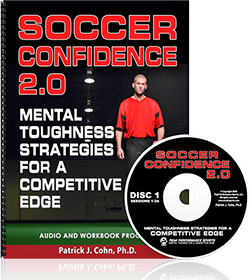 Being confident for soccer games is just one aspect of having a strong mental game.